Ahhhh new beginnings, the hopeful feeling carries over into my new underwater photography website and blog that I’ve been working on — very diligently. 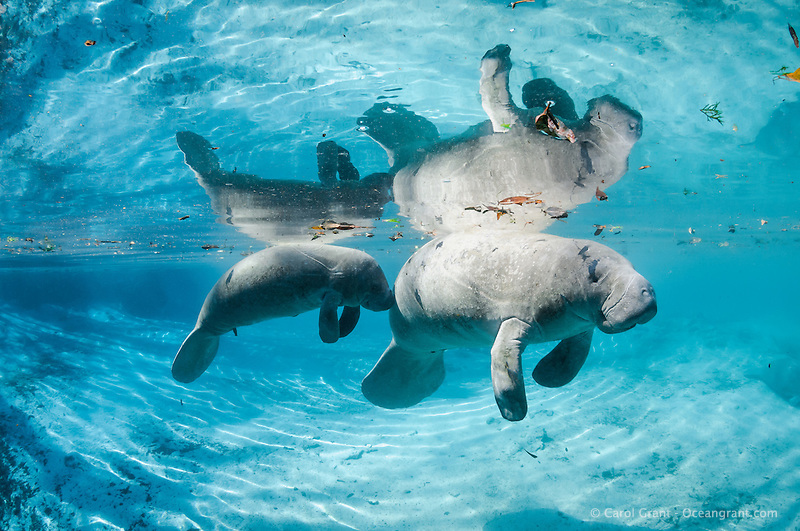 Manatees, manatees and more manatees, the new Oceangrant site starts off with nearly 700 quality photographs, the vast majority focused on our charismatic sirenian the Florida manatee. And I have more manatee photographs to add! I believe this is the largest and best quality collection of diverse and rare images of the Florida manatee around. PhotoShelter is the service I was interested in using for my redesigned site, and then came the release of their new cutting-edge BEAM templates. 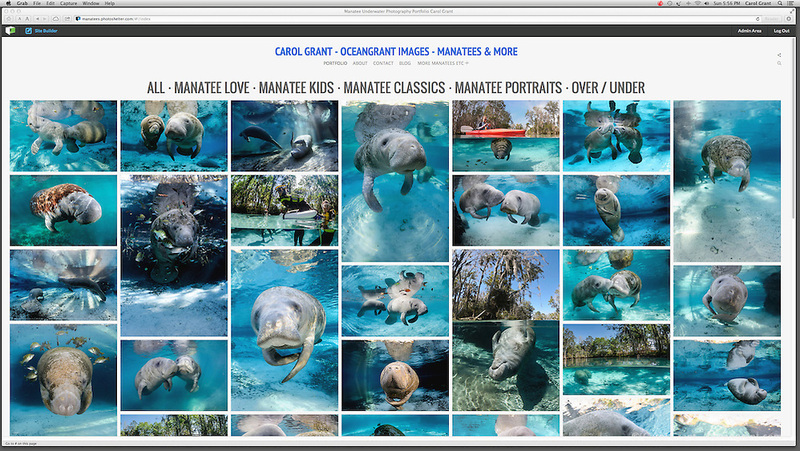 I was impressed and chose the new Shuffle design as the best way to display my varied collection of manatee images. Each of the new BEAM templates are cool in their own right, but Shuffle fascinated me with the Portfolio page that can be focused on your website visitor’s needs and interests. I have my Portfolio page divided into five categories that draw from five photo galleries out of my 14+ galleries. It’s intuitive and the structure can be picked up by playing around with it. 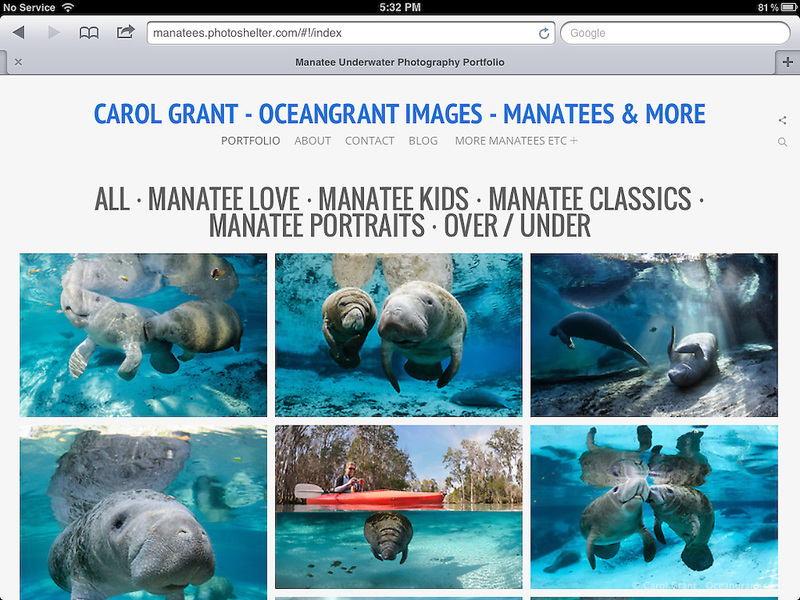 Here is how my new manatee portfolio page is set up: First, load time on oceangrant.com (or manatees.photoshelter.com if one finds their web address for my site) is very fast for so many photos, sized for whatever device is being used. Next, clicking on ALL pulls images from each of my featured manatee galleries. It loads them in sequence, e.g., one image from first gallery featured, one image from second, and on and on. ALL quickly displays the most diverse collection, beautifully, on any screen. Note: BEAM is still in beta so I’ve notice some bugs, especially on iPhones, but those are being worked on and the issues are disappearing systematically. Here’s a computer desktop screen shot and one from my iPad of my ALL selection.